It’s difficult to pinpoint the exact moment that the story for Full Heart Farm begins, as I’m sure most first-generation farmers can attest. Pieces of it started to form over childhood family dinners and gardening with my mom. They formed around celebratory summer barbecues with extended family and elaborate Thanksgiving feasts prepared alongside my Pop. I had an upbringing centered on good food, family, and hard working parents. It wasn’t until college that I began thinking more critically about those things, especially our food system. I had left my hometown (ever so sure I would never return…) to pursue a career in magazine layout, with the dream of becoming an editor for a food magazine. But once I started reading, I realized that it was the food that interested me the most, especially where food came from, and the people that grew it. I volunteered for a few summers on farms, and increasingly spent more weekends and time between classes working on farms and in gardens. I fell quickly in love with the incomparable joy that comes from producing a tangible product. I was enamored with the tiny miracles happening all around me, as seeds turned into food that tasted better than anything I had ever eaten. The solution to so many of our country’s health and environmental problems became clear to me: eat more local food. And I was hungry to be a part of the solution. My junior year of college I moved abroad to work on a 1,500 acre sustainable farm in Tuscany, Italy. My time there confirmed the biggest questions in my mind: could I farm every day? And would I enjoy it? Yes and yes. Wholeheartedly. From the minute I arrived home to the US, I began working tirelessly towards the dream of starting my own farm. My senior year of college I worked two jobs while taking classes full-time, leaving the house at 4am to milk cows before studying. After graduation I returned to CT to farm full-time as an apprentice, and later on as a farm manager, saving every penny I earned. Full Heart Farm existed before the parcel of land was found. The business was established, the loan paperwork in place, the seeds and piglets and chicks ordered, and the daily search for a tiny plot of land to call home was taking place. Evenings were spent poring over excel sheets, developing a website, and binge watching Friday Night Lights. It was Coach Taylor’s refrain of “Clear Eyes, Full Hearts, Can’t Lose” that echoed in my mind every time a moment of courage was needed to move forward with farm plans and step into uncertainty. Those words inspired the name of our farm and still hang in our home today. At age 24 I "retired" from my career as a farm manager to pursue my dream of having a farm of my own. I had a small chunk of hard earned savings and lofty plans for a run-down former horse farm just two miles up the road from my childhood home. I signed the closing papers for the farm with a station wagon full of piglets. Our first box of chicks arrived in the mail the following week, around the time when the first of our vegetable seeds emerged from the freshly tilled pasture, and the rest is history. A year after the farm was started, Keith moved to the farm. We were married that May on the coldest, rainiest day of spring in our yard, surrounded by friends and family and more love than we had ever experienced. The following year, Henry arrived, bringing endless happiness to the farm. Two years later we met Cora, who taught us just how limitless our love is, and just how much we have to be grateful for. Two years after that, sweet Sadie completed our family and joined our farm crew. 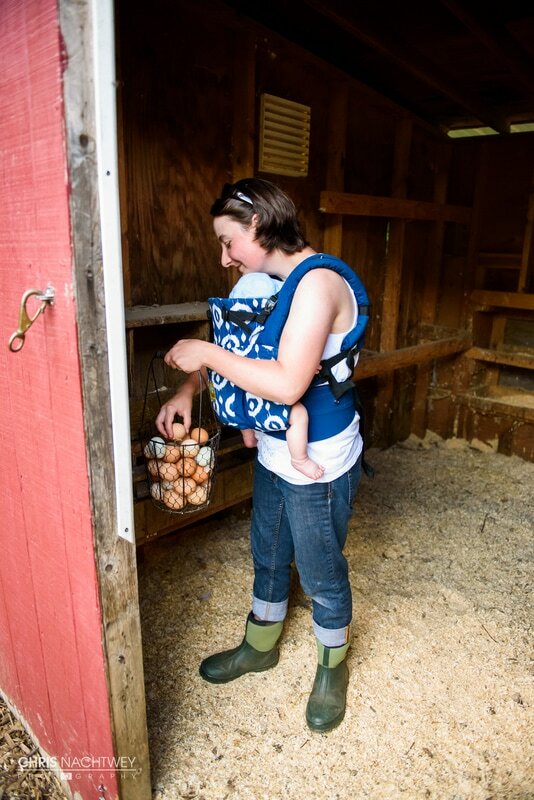 Each season the farm evolves to suit the needs of our growing family, as all sustainable businesses tend to. 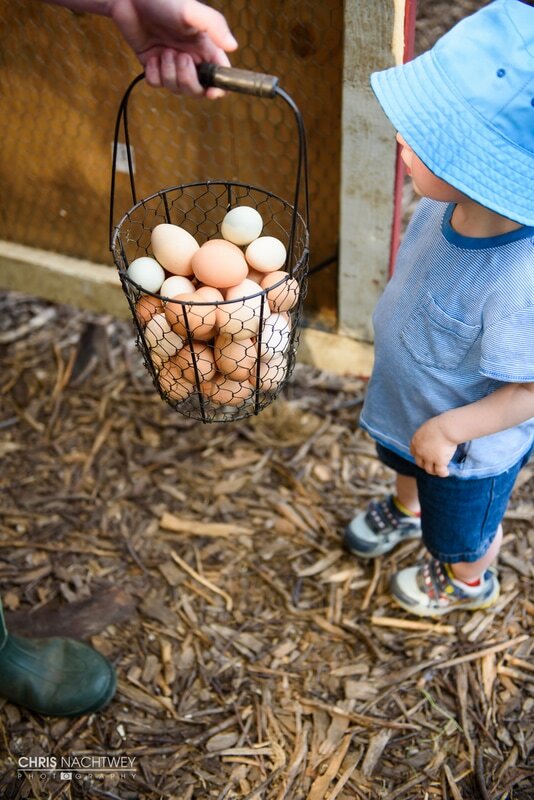 Early in our farming endeavors, we raised thousands and thousands of chickens, for meat and eggs, but also for fertility. We raised dozens of pigs for pork and their natural land-clearing abilities. Our farm infrastructure was built piece by piece, using mostly our own labor, so that we could avoid the stresses of debt. Now, as our schedules require an increasing amount of flexibility to be able to nourish our children's interests, we primarily raise specialty vegetables and cut flowers. As there is nothing more important to us than sharing healthy, fresh food and beauty with our community. Farming, as a lifestyle or a profession, is not for the faint of heart. We've experienced more than our fair share of hardships thanks to relentless weather, storms, pests, and more. But we persevere because we believe that our work is important. In it's most simple and pure state, food is a powerful impetus for change. We have nourished dozens of farm members undergoing cancer treatment. We have fed over 100 pregnant and nursing mamas, choosing to give their children the healthiest start they can imagine. We have donated box after box of food to hungry seniors in our community. But it's the tens of thousands of meals in between all of those major life moments that are powering the local food movement and bringing meaning to our harvests. We are so grateful for the honor of being YOUR farmer.